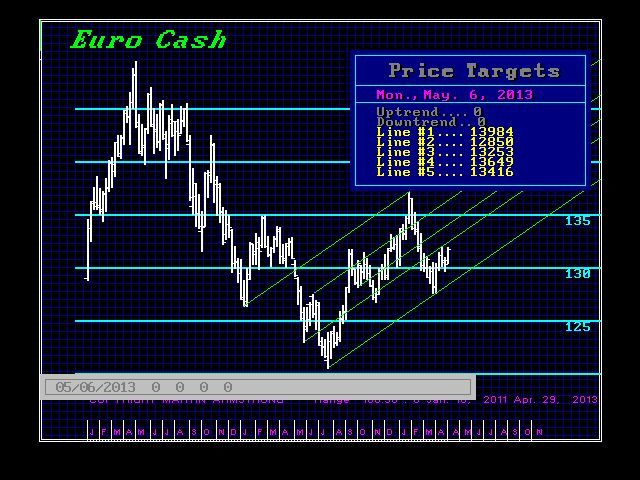 The Euro peaked in two weeks, fell back, and has rallied into this week. Nonetheless, key resistance still remains unchanged in the 13400 zone and the turning points are the weeks of 05/06 and 05/20. The top of the channel for resistance we warned about was in the 13400 level which has not been reached as yet. A weekly closing BELOW 13350 this Friday will keep the Euro neutral to bearish short-term. So far the high has been about 13242. So we have not reached critical resistance yet. If there is going to be a drop, it would most likely come going into the week of 05/20. There should be some rally and then we have problems for the fall. We need to see a closing on a daily basis ABOVE 13400 to suggest a rally before the decline. The Weekly Bullish stands at 13913. So this currency is not headed upward on a sustainable basis.